Tristis Poplar is a large deciduous tree. It is cold hardy, disease resistant, and relatively drought tolerant. 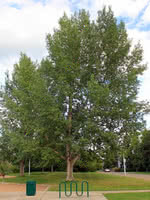 Tristis Poplar loses its leaves later in the year than other Poplars, making it a great ornamental tree in fall. It's known for its strongly scented balsamic buds and yellow foliage in autumn. Because of its size, Tristis Poplar is most suitable for large properties and will help prevent wind erosion. Tristis Poplar is slower-growing than many newer hybrids, for a longer useful lifespan. Tristis grows especially well in the southern prairies due to its resistance to cold dry winds.